Trying to explain my love for Lucio Fulci's early 1980s horror films to any rational person is a losing proposition. I realize I'm defending the indefensible, and my attempts to explain away the director's trademark incoherence as “nightmare logic” have the ring of desperate rationalization to them, but that's my story and I'm sticking to it. 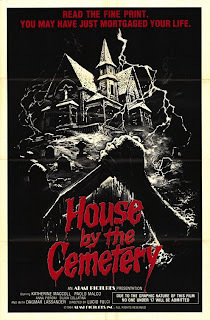 Even by Fulci's loose standards, though, HOUSE BY THE CEMETERY is especially shoddy work. Like most Italian movies made from the sixties through the eighties that weren't directed by Fellini or Antonioni, this is nothing more than a cheap attempt to cash in on the popularity of another film or genre. In this case its something in the ballpark of THE AMITYVILLE HORROR meets THE SHINING, only with considerably more gore and considerably less artistry than Kubrick's film. Hell, it even makes Stuart Rosenberg's workmanlike direction on AMITYVILE look good. But here's the thing. If there's one area that Fulci always excelled in when directing horror, it was atmosphere. Well, that and gratuitous gore, but anyone can pull off a gross-out with enough fake blood and entrails. Fulci had a knack for creating a real sense of supernatural dread in his films that goes a long way towards making up for his incomprehensible plots, at least if you're a horror junkie looking for a fix. And despite the utter stupidity of this film, it still has that atmosphere, and that's enough for me to give it a pass. 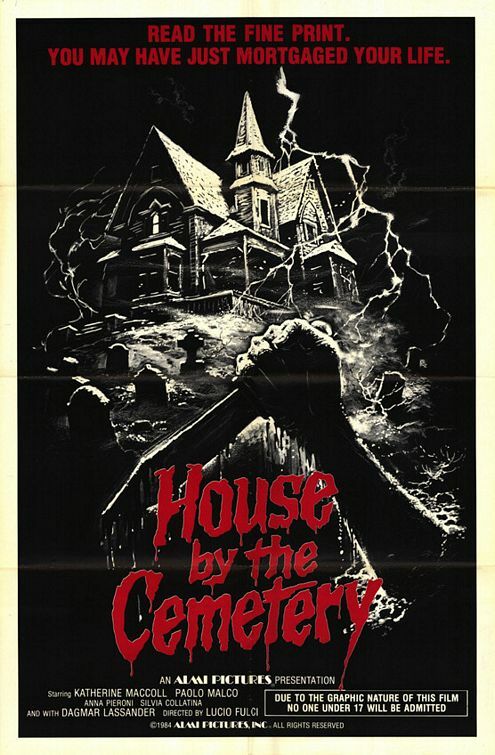 Trying to write a plot synopsis of this film is no easy task, but essentially a New York professor (Paolo Marco), his wife (Catriona MacColl) and their son Bob (Giovanni Frezza) move into a New England house that used to belong to one Dr. Freudstein so that the professor can work on a research paper about suicides. Lots of weird stuff happens involving decapitated mannequins, ghost girls, the possibility that the professor has been here before, and the fact that Dr. Freudstein's grave appears to be in the dining room floor. Will the family wise up in time and get out, or will they fall prey to the vengeful undead? Were this one of Fulci's better horror flicks like ZOMBIE, THE BEYOND, or CITY OF THE LIVING DEAD, I would better be able to defend the bizarre and often silly goings-on. On those films, the maestro was working with halfway decent scripts, though. Here, he's got nothing, and yet still manages to turn it into something entertaining and creepy. I'm not saying its good, mind you, but it's not without its appeal if you're a fan of this sort of Eurotrash. 2 1/2 out of 4 stars.